If you trade stocks for several days to a few weeks at a time (swing trading), then you’re in the right place. We’ve helped thousands of swing traders with our trading industry articles, webinars, videos, courses and alerts services. You’ll find free & premium swing trading resources in this section. You will also discover a recommended sequence of what to learn first, second, and so on — plus links to get more detailed information. Are you swing trading stocks successfully yet? Many of my traders ask for my help in learning how to swing trade more consistently. This step-by-step swing trading article will get you up to speed on the basics of what you need to know to swing trade stocks using my core professional trading strategy. This trading style looks to capture profitable trades during entries and exits of anywhere from several days to several weeks. Personally, when I swing trade I like to trade a handful of positions on small share size (less than 100 shares to get started with) that I can then scale into over time, if the trade works out. Unlike day trading, swing trades have the added risk of potential overnight gaps against you, which can be expensive (like a loss I took once many years ago in ORCL on an earnings miss gap swing trade). On the upside, the profit potential is much bigger, because you can ride a trend for several weeks and many points, before it consolidates or reverses. My primary swing trading chart, as seen below, is a 15–day, 15–minute candlestick chart with a white background and green and red candles, with volume at the bottom. I like to see at least a minimum 10% price action range from top to bottom on the charts I swing trade (for example a $30 stock must have at least a three–point high/low trading range to be worthwhile, from a volatility standpoint). Instead of entering on pivots or using lagging indicators, I simply buy strong breakout charts that show specific long patterns – such as bullish cups, acceleration ramps, and gap continuations. I always look to add to winning trades every two points or so to leverage my profits. Similarly, I use a maximum two dollar protective stop (or loss of two days support, whichever is smaller) to manage risk. Swing trading is buying and selling stocks for timeframes of several day to several weeks. 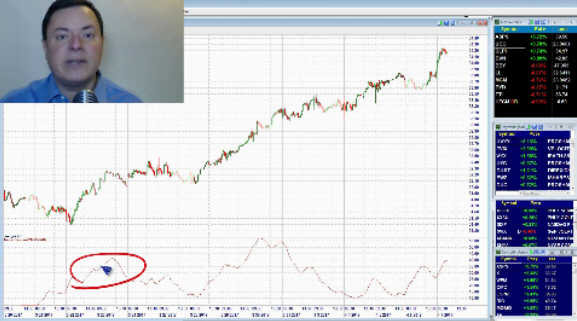 Many traders start their trading careers with this popular method. It is important to develop and test your trading ideas with a specific trading plan that includes entry & exit criteria, risk management and technical patterns you will be trading. The number one rule for swing trading is to always always use a protective stop for all the many many trades that will go against you. Although the potential upside reward is great in swing trades, the risk is also higher, and you can lose a lot of money if you fail to keep tight stops.I know this is common sense, but speaking from experience it’s like diet and exercise — it’s easier said than done! I like to set my initial stop loss within 24 hours of getting an order confirmation for any swing trade. Find the types of charts that you trade most successfully. Personally I prefer swing trading charts in the $20 – $70/share price range. But you may like cheaper stocks, or more expensive ones. The key is to test, test, test patiently until you find the most consistent trading approach and types of stocks to trade the works for you personally. There are no magic indicators or silver bullets when it comes to trading. It’s all about risk management and taking many trade attempts to try and get a few that work out with reasonable profits. Don’t swing for the fences, I advocate trading wide not deep, meaning small share size initial positions of 100 shares or less, to diversify risk as well as profit potential. I hope this helps you in your swing trading — best wishes for upcoming success! Configuring your charts for swing trading is easy. I use a 15-day 15-minute candlestick chart, with volume. You can test different timeframes; some traders prefer 10- or 22-day charts. Downloadable Video Course: New for 2017! Ordering is easy! You’ll get an instant download link to a .zip file (284Mb) which contains your .wmv 40-minute video, excel spreadsheet & PDF (limit 3 download attempts). For more on our new instant downloads click here.